In small bowl, mix dressing and mustard. In 3 1/2- to 4-quart slow cooker, arrange potato slices in even layer; drizzle with one-third of the dressing mixture. Arrange onion slices on potatoes; drizzle with one-third of the dressing mixture. Top with carrots and cabbage; drizzle with remaining dressing mixture. 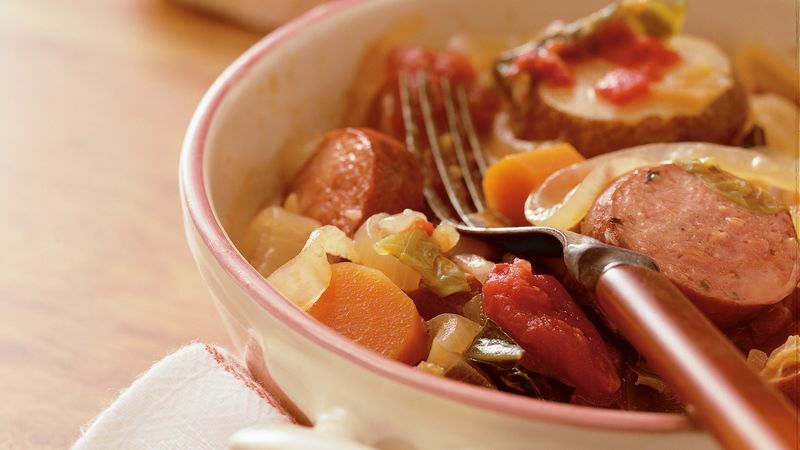 Arrange sausage slices on vegetables. Pour tomatoes in even layer over sausage. The skin of red potatoes is usually more tender than the skin of russet potatoes, so you may want to try red potatoes for this casserole.